This message lays out the ungodly worldview of evolution and highlights the truth that it is taken solely by faith. Many people, including the lost and some Christians, do not understand this concept. Let’s bring all knowledge including science under the authority of God and His Word. People are freed from doubts by understanding that true science does not contradict Scripture. Science is knowledge based on observation, experimentation, and repetition. It is exciting to look at a principle of science, see how it works, and how we humans use it to help us today. This is called “Operational Science”. REAL Science. However, not everything that is called “”science”” is science. Learn to discern between what is SCIENCE and what is interpretation based on someone’s worldview, how to recognize the difference between Evidence and Viewpoint. REAL science always affirms what the Bible says. REAL science always agrees with God and should be used to give Him the glory He deserves. 10:30 am – It’s About Time! 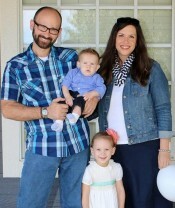 Kevan Myers and his family have been called to engage the culture on many front lines: Life, Creation vs Evolution, Bible Authority, and Moral Purity. They do this through preaching and teaching the word, through tract distribution and public preaching of the gospel, standing outside abortion clinics, and with the written word. There IS still time to win a battle before the sun goes down!